Recently I had the opportunity and privilege to be part of a group that included three tribal chairs – what an awesome experience! I had to pinch myself as I sat listening to the passionate voices of these leaders who care for their constituents; I knew I wasn’t back in a history class at school, but I sure did learn a lot about our Native Nations. 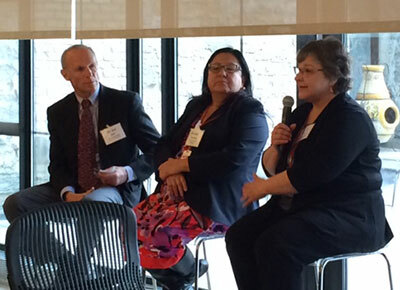 The examples shared by Chief Executive Melanie Benjamin, Mille Lacs Band of Ojibwe and Chairwoman Karen Diver, Fond du Lac Band of Lake Superior Chippewa, moved me to want to know more about my neighbors and my ancestors. • Reservations have typical Minnesota rural issues in addition to experiencing constitutional reform with no tax base and diminishing grant dollars. • Tribes are poised as economic entities and their impacts can be significant. • A renaissance is going on worldwide that is changing the cultural and economic conditions of Natives as evidenced by the change in per capita income, but there’s a huge deficit to be made up. The story goes in my family that my grandmother Onna (Buck) Wickham grew up on what is now known as the White Earth Reservation in Becker County. My family had no connection back to White Earth, but I’m sure if I went looking I would find someone who remembered my grandma’s family. I think all of us have these connections in life and many are fortunate enough to trace back their family heritage. It is truly a great time to be thankful as we move into this holiday season. In this great big universe, it’s nice to be reminded that we are all connected!